These variants were fitted with the French Snecma M88 afterburning turbofans. The technology demonstrator Rafale A was flown using the GE engines because the M88’s development was not finished at the time. The engine is capable of 50 kN of thrust (11,250 lbf) and 75 kN (17,000 lbf) with full afterburner. 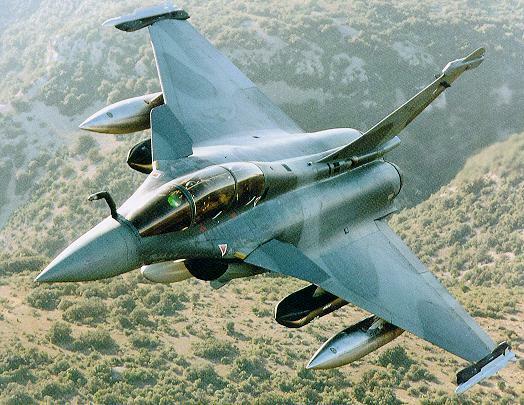 The term used by the French for this fighter is “omnirole”. This is because Dassault wanted to differentiate their fighter from the others, and also because the Rafale was intended to replace most of the fighters used by the French Air Force and Navy. The Rafale carries, for the first time in aviation history, an integrated electronic survival system named SPECTRA which features a software-based virtual stealth technology. The SPECTRA electronic warfare system, jointly developed by Thales and EADS France, provides the aircraft with the highest survivability assets against airborne and ground threats. The cockpit has Hands-On Throttle And Stick control (HOTAS). The cockpit is equipped with a head-up, wide-angle holographic display from Thales Avionique, which provides aircraft control data, mission data and firing cues. Also, the aircraft can carry up to 9 tonnes of payload on 14 hardpoints(the Rafale M only has 13 hardpoints). The range of weapons includes: Mica, Magic, Sidewinder, ASRAAM and AMRAAM air-to-air missiles; Apache, AS30L, ALARM, HARM, Maverick and PGM100 air-to-ground missiles; and Exocet / AM39, Penguin 3 and Harpoon anti-ship missiles. The Rafale was first deployed into action in 2002 during Operation Heracles, where Rafales were deployed from the Charales de Gaulle aircraft carrier and flew over Afghanistan. In March 2007, three French Air Force and three Navy Rafale fighters began deployment in Tajikistan in support of the NATO International Security Assistance Force (ISAF) in Afghanistan. The Rafale was expected to replace 7 aircraft by 2010. The Jaguar, Super-Etendard, Crusader, Mirage F1, Mirage 2000 C, Mirage 2000 N/D and the Mirage 4. Dassault Aviation was expecting an order for 232 aircraft. The French Air Force and Navy have ordered a total of 61 fighters so far: 36 for the Air Force and 25 for the Navy. Will the M variant carry the same weapons and configuration as the B and C variants, particularly the air-to-ground weapons? we have planing to buy many Mirage spare parts ,pls advise if you able to provide .